Paige, Naomi, Jimmy Uso and Tamina are at dinner. Jimmy is making jokes the whole time. Everyone already thinks he’s hysterical but Naomi thinks Jimmy should try stand-up. She wants Jimmy to explore other opportunities since the WWE is giving them all this exposure. Backstage, Jimmy and Naomi are hanging out when Dolph Ziggler walks up. He tells Jimmy the good news. He knows someone at the world famous Laugh Factory and was able to get Jimmy Uso 3 minutes on that stage for his stand-up debut! While talking, Renee Young also reveals that she used to do stand up comedy. At home, Naomi wants Jimmy Uso to try out some of his material on her and her Dad. While Jimmy gets ready, Naomi and her Dad decide that the best way to make Jimmy feel comfortable is to be in their underwear, like the public speaking tip: “Imagine everyone in their underwear.” FYI: Don’t do this. It’s a myth. It doesn’t work. #TotalDivas LOL at Naomi and her dad in their underwear to make Jimmy Jon Uso more comfortable telling jokes. All the jokes are about “his wife,” which we all know means Naomi: morning breath, bad gas, shower caps in the hot tub. All the jokes are killing… with Naomi’s dad but not Naomi. She wants Jimmy to change his material. Also, Naomi’s dad is in trouble for laughing way too hard at those jokes. Later, Naomi runs into Dolph backstage. He asks about Jimmy’s set. Naomi explains that all the jokes are embarrassing and about her. Dolph laughs; the jokes being personal make them funnier. He tells Naomi not to worry and explains that stand-up is like wrestling. It’s a version of you but it’s not the whole truth. #TotalDivas Naomi's taking comedy advice from Ziggler. Uh-oh. Naomi and Jimmy Uso meet backstage after Naomi’s new look photoshoot. Naomi wants to hear some of Jimmy’s new material. He tells her a joke. Jimmy: You have to wrench (rinse) it off before you eat it. "Knock Knock. (Who's there?) Wrench. (Wrench who?) You gotta wrench it off before you eat it. 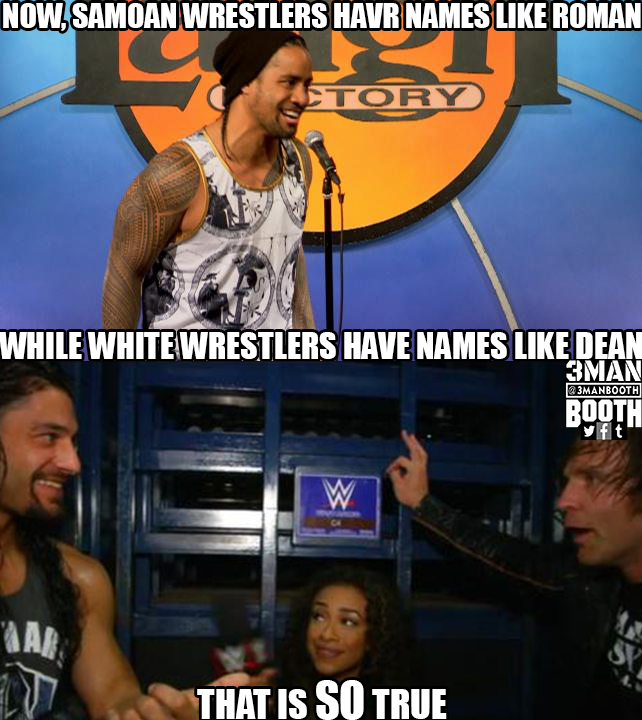 – Jimmy #TotalDivas Did Jey Uso write this? He tries the same joke on Tamina. Still not good. Naomi sees how much Jimmy has been struggling so she gives him permission to tell the jokes about her. By the time they get to the Laugh Factory, Jimmy is nervous. His palms are sweaty, knees weak. He meets the owner Jamie Masada who tells him not to worry. Dolph gets on stage and starts stealing the show, naturally. #TotalDivas Ziggler: "Anybody single here today?" | *Crowd Cheers* | "That was so much easier than Tinder" | Maybe Ziggy's comedy IS good. Then it’s Jimmy’s turn. He stumbles at first but once he starts making fun of Dolph (“Look at him! He’s the kind of guy that you can’t go to the beach with. He just glistens and runs in slow motion.”), he eases right into his other jokes. He didn’t even have to use any of the jokes about Naomi! He did a good job on stage, nerves and all, for his first time. Very impressive. #TotalDivas Jimmy Jon's set went from roasting Naomi to roasting Ziggler. #TotalDivas Jon's getting laughs…too bad his comedy is too explicit for E! After horsing around with Nikki Bella outside the arena, Brie Bella watches in the back while Daniel Bryan heads to the ring to forfeit the IC title due to injury. Brie’s upset because the same thing happened to him last year. The job takes a physical toll on your body and she’s not sure if Daniel Bryan should keep doing it. #TotalDivas loves making me relive the sad Daniel Bryan moments. Brie and Nikki have brunch in Central Park. Brie tells Nikki her concerns and Nikki tells Brie to be careful when talking to an athlete about the end of their career. His dream is ending. Brie says Daniel Bryan has other dreams, like being a father and having a family. Daniel Bryan joins the Bella family (Mama Bella, JJ Bella, wife of JJ Bella) for a birthday lunch. And he has even more good news! His doctors have cleared him to get back into the ring. The WWE still needs to give the go ahead; they are going to take some time to evaluate. Brie thinks Daniel should not return to the ring. Daniel thinks he needs to return to the ring for their future; he can make more money for them and their future kids. Mama Bella wants Daniel to change his ring style if he returns to the ring. JJ Bella thinks Daniel Bryan is one of the best wrestlers ever and should be in the ring. Daniel Bryan and Brie Bella meet backstage. Daniel was there to meet with the WWE about his return. They are afraid to let Daniel Bryan wrestle at this time. That means Daniel and Brie discuss Daniel’s potential future in wrestling. Daniel wants to wrestle again but Brie wants Daniel to think about his life post-wrestling, like raising a family. Daniel asks Brie if she thinks that they have enough money if he retires. Or if they’ll have enough money just off of Brie’s career. Daniel wants to know if Brie wants him to get back in the ring. Brie doesn’t want to answer. If she says no, he’ll resent her for the rest of his life. She feels like Daniel has already made his decision and it doesn’t matter what she says. Daniel asks if he’s ever resented her for anything. He wants her involvement in this. This is the most serious conversation on #TotalDivas ever. Paige and Kevin go window shopping. Kevin is asking Paige a lot questions like what is her ring size, what type ring shape she prefers. All not so subtle hints that Kevin is looking to propose. Paige tries to diffuse the situation and talk about a Batman ring instead. At Paige’s house, Paige, Emma and one of Paige’s roommates discuss Kevin’s possible proposal. The roommate says that he’s been with Kevin all week and he hasn’t mentioned anything. Emma doesn’t believe him and goes on a hunt in the apartment to find the engagement ring. Emma still going for that #TotalDivas Season 05 Spot! #TotalDivas So coming off a trust issue conversation, Paige and Emma are snooping through Kevin's belongings to find the ring. Not smart. Emma has had more screen time on this episode of #TotalDivas than her entire main roster stay. Emma is checking everywhere: inside vases, in dresser drawers. And then she finds a small black box! Inside: A Coin! Kevin collects coins, you guys. Emma keeps searching and finds another box in the closet. This time there’s a ring inside! Paige tries on the ring and it fits so she starts freaking out. She’s not ready to be married. Is she ready to be engaged? Maybe. Married? No. Paige bring this news to the rest of the Divas (Alicia Fox, Rosa Mendes, Summer Rae, Nattie, Emma, Renee Young). They ask Paige the same question: are you ready to be married? Alicia points out that Paige should listen to Nattie: she the only married one in the group. Alicia tells Paige to fake a sickness, which Paige does. Paige and Alicia Fox talk about the dinner and the inevitable conversation. Paige will talk to Kevin about taking things slow. It seems she’s the only one taking things slow; Alicia wants to be a bridesmaid and is already planning the bachelorette party. She already invited Lilian Garcia! Paige and Kevin visit a tattoo parlor. They are being helped by Sasha (not the one you want), the tattoo apprentice. #TotalDivas Why would you tattoo "Will You Marry Me?" in the most hideous scribbly fashion on your arm? Kevin chose poorly. Paige asks Kevin if this is real; Kevin gets down on one knee and shows Paige the ring. Paige says yes eventually. She’s still in no rush to get married but is okay with being engaged for a while, a year at least. #TotalDivas PAIGE SAID YES! HOPE LILIAN GARCIA'S STILL INVITED TO THE BACHLORETTE PARTY! I don't want to cry during #TotalDivas, god damnit. This entry was posted in Season 04, So That Happened, STH, Total Divas, WWE and tagged Alicia Fox, Brie Bella, Cameron, Daniel Bryan, Dean Ambrose, Dolph Ziggler, Emma, Jimmy Uso, John Cena, Kevn Skaff, Naomi, Nikki Bella, Paige, Roman Reigns, Rosa Mendes, So That Happened, STH, Summer Rae, Tamina, Tamina Snuka, The Bella Twins, WWE. Bookmark the permalink.